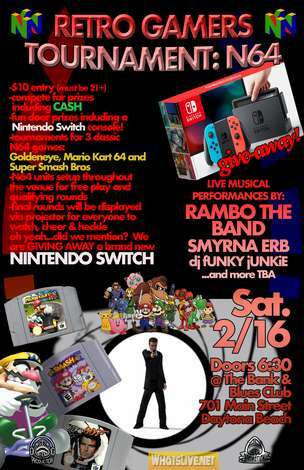 > Events in Florida > Retro Gamers Tournament: N64 - 3 Games in 1 Night! Door prizes including a NINTENDO SWITCH! Retro Gamers Tournament: N64 - 3 Games in 1 Night! Door prizes including a NINTENDO SWITCH! -Your entry fee includes general admission. All attendees must pay the entry fee regardless of tournament participation. -Compete for bragging rights and to win cool prizes including, cash! A BRAND NEW IN THE BOX NINTENDO SWITCH CONSOLE!!! That's right, included in your entry fee is your chance to win a Nintendo Switch. Participants can compete in 1, 2, or all 3 game tournaments if they'd like to. Just be sure to signup for time slots that don't conflict. Doors open at 6:30 and a qualifying station for each of the three tournament games will be set up each with their own judge. The judges will help participants signup and answer any questions. Once all qualifying rounds for a particular game have limited the player pool down to the top 4 players, finals will be held for that game and will be displayed via projector for all of the venue patrons to watch. Cheering and heckling is encouraged! Prizes will be awarded to the first, second, and third placing finalists for each game tournament.